Feb. 9 was the day six women from the Galician non-profit organization Ve-la luz (See The Light) decided to start a hunger strike downtown Madrid, our capital. They are determined to be the voice of those who cannot speak anymore. They´re fighting for all of us: for the ones that have suffered violence, for the ones that are suffering it, for the ones that will suffer it. They’re fighting to make the Government accept violence against women as a matter of state, so that they make more powerful laws to reprimand the abusive husbands, boyfriends and ex-partners and so that abused women and their children get the protection they need. The first seven days, they were absent from any mass media. But now they can’t ignore them anymore. Hundreds of girls, women, children and couples have come to support them and they have picked up more than 11000 signatures to help support their initiative. But the truth is they need many more to even get a hearing at the Parliament. Gloria Vázquez (on the left), president of Ve-la luz, and two of her fight partners. In the 44 first days of 2017, 9 women had officially (which means, recognized by the Government) been murdered by their partners or ex-partners in Spain. Eight more are under investigation. The fact is: this violence against us isn’t just like any other violence. Of course men get killed too, but the murder of a man does not have behind it a whole sociopolitical system supporting that death. Patriarchy justifies and explains the brutal violence women live in this society and it is obvious that we need special laws and special protection. Spain has done a lot in the past years. They have created a phone number that doesn’t show on your phone bill that is special for women who suffer this violence and are unable to leave the house or afraid to go to the cops because they fear for their lives. But still, there have been cases where the woman reported being physically and mentally abused up to 20 times and she still got murdered by their partner. 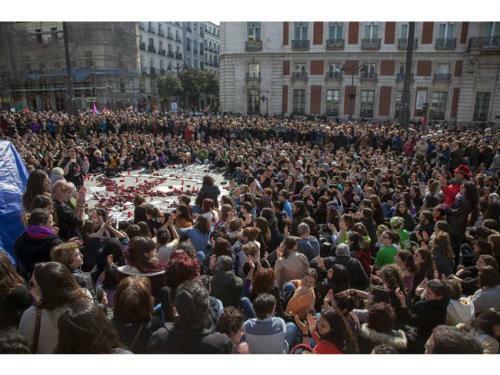 These women fighting in Puerta del Sol are doing it for every woman. Because we all can come across a toxic boyfriend and not realize it until it is too late. Hopefully we’ll never get yelled at, but maybe we do. Hopefully we’ll never get beaten, but maybe we do. Hopefully we’ll never get killed… But maybe we do. We are not asking for too much… We are just asking to grow older, to have the right to stay alive. The facts speak for themselves. The macropoll the Government of Spain organized in 2015 to analyze gender-based violence detected that 12.5% of women over 16 had suffered physical or mental abuse from a partner or ex-partner throughout their lives, which means about 2.5 million women. On teens aged 16 and 17, things get even worse: 25% of girls said they had suffered this kind of violence on the past year. That’s why the hunger-strikers have written down 25 things our politicians need to address, including the Government paying the child support of the children of an abused woman, so that she doesn’t have to negotiate with her abuser, or that full custody goes to the woman in case abuse has been reported (which, sadly, still happens, and there have been awful cases where the ex-husband even kills the children just to hurt the woman). It has been 12 days and the fight is still going. All our support goes out them.